It has been a while since I blogged. Perhaps it is because I have been under the impression that Kenyans understand Intellectual Property Law and the rights system that surrounds it. I have been approached with interesting remarks about how IP rights are so obvious and how there is no need for IP attorneys like myself. Perhaps not! Ignorance is still rife in this area of law judging by some of the articles I have been reading in the past few months. Case in point, the IP controversy around Lit 360 Show and another which escapes my mind. Today, I read an article on the Business Daily that has sent Kenyans and lawyers alike in some sort of panic regarding the renewal of the “Hakuna Matata” Trademark by Disney. Why are we in a panic? I know! We still habour a lot of assumptions about trademarks and the IP rights system in general and we are stuck with the misrepresented or misinterpreted information of how the IP system works. This article unfortunately is quite misleading with due respect to its author. A Trademark is a branch of the IP rights system that grants exclusive use of a name, word, logo, symbols, combination of all these and colour as well. To be granted exclusive rights, a trademark MUST not be descriptive of the applicants goods or service. Which means it must be unique or uniquely used. However, restriction of such use is only on made up words or symbols originally created by an applicant and such creation and use has never been used or seen. Such restriction is also territorial, which means that it is protected in areas designated or chosen by the applicant. Because of the territorial nature of trademarks in this context, the strength will depend on the country designated by looking at the language, culture and use. The use of words in trademarks can be unique in one territory and obvious in another, and may also require a “Disclaimer” where the words are obvious or ordinary. For example, if I wanted to register a trademark for a shoe collection in Italy and I called it “Mama Mia”, I will not be getting exclusive rights in Italy over the word as it is an ordinary phrase in this particular country which means “My Mother.” If the name is available for registration for my clothing brand, I am likely to be granted but the question of how strong my shoe brand is another all together. However, if I registered it here in Kenya, I would be required to give a translation instead since Kenya is not an Italian speaking country. This application in addition will be granted in my particular class of business under the Nice Classification appropriate for shoes ( selling or manufacturing) depending. This then means that there can be a TV brand called the same, or Ice Cream or any other non-competing businesses with the exclusion of shoes. This is why ingenuity in creation of brands is important to gain exclusivity in its strict sense that is mostly sought by applicants. Here in Kenya, KIPI, the government custodian in charge of TM registrations also needs to start incorporating the “Disclaimer” system on Kiswahili words and may be even Sheng and ethnic words as they ordinarily used in our linguistic culture. Where the words are obvious/ ordinarily, a disclaimer is important to stop this confusion. It is imperative for you my readers to know that a trademark does not prevent you from using the word in its ordinary sense, therefore no loss there! The circumstances may vary to some extent, for example in some Fashion Law cases which I shall save for a future blog post. It is also good for you to know that in Kenya, trademarks are not granted for names, for example Wambui, Ochieng, Elizabeth, Kibet, Nzomo etc. These are ethnic names and ordinary English names that one cannot gain exclusivity over. However, the stylistic nature in which you write or design these names and other ordinary words is what get’s protection, and where you find it fit, you can declare the colour to a tee! 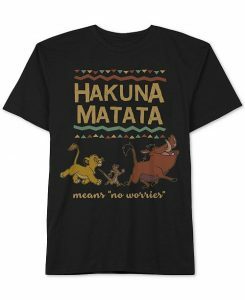 For your information, Disney has had the trademark “Hakuna Matata” since 1994, and it has since been renewed since they are renewed every 10 years. It is registered under Class 25 for Clothing,Footwear and Headgear. A brilliant strategy in Disney to enhance revenue collection from the Lion King Movie through merchandizing in the apparels sector. In addition, there are so many other trademarks in different classes registered by other businesses including hair oil products. Let us have a conversation about Traditional Cultural Expressions in another post! Stay tuned for posts on upcoming IP trainings by yours truly and the Center for Intellectual Property and IT Law at Strathmore Law School. It is important to educate yourself on IP law and the rights systems that make the business world go round!